We at Hokusei North America would like to wish all of our customers, partners, and parent company associates a Happy New Year and best wishes for 2019. 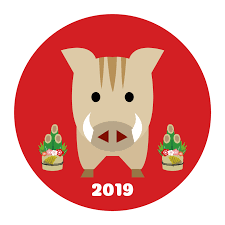 According to the Chinese zodiac celebrated in Japan, 2019 is the “Year of the Boar“. In Japan, boars are thought to be considerate, independent, responsible, and optimistic creatures. We at Hokusei North America certainly hope to live up to these qualities and create value and new friendships during the next 12 months!